Stockport County joined the Football League in 1900 and competed in it continuously from 1905 to 2011. The team spent most of their history in the lower reaches of the Football League, but the 1990s were more successful with the club competing in the First Division (now known as the Championship) for five seasons, whilst they also reached the League Cup semi-finals in 1996–97. However, instability on and off the pitch eventually led to Stockport falling back to the lower divisions. The club started the 2011–12 season in the Conference National, having been relegated from Football League Two for the first time in their history at the end of 2010–11. They are currently the longest surviving Football League team to drop out of the league, having played in the league for a total of 110 years. At the end of 2012–13, Stockport were relegated to the Conference North. Stockport County was formed in 1883 as Heaton Norris Rovers by members of the Wycliffe Congregational Church, and played their first recorded game in October the next year. The club adopted 'The Hatters' as their nickname, owing to Stockport's history as the centre of the Victorian hat-making industry, a nickname that is shared with Luton Town. Stockport played in the Lancashire League until 1900, when they gained admission to the Football League Second Division. Stockport's first Football League match was against Leicester Fosse which ended in a 2–2 draw. Stockport left their Green Lane home in 1902 and moved to Edgeley Park where they currently reside. The club finished in the bottom three for their first four seasons, and at the end of 1903–04 they failed to gain re-election. They spent one year in the Lancashire Combination (a league which they won) and the Midland League. At the end of the season, they were re-admitted to the Football League after being re-elected through the Midland League. In their first season back in the Football League, Stockport reached the first round of the FA Cup for the first time; however, they were knocked out by Lincoln City. Stockport finished the league in 10th position that season. Stockport remained in Division 2 of the Football League for seven years until 1912–13 when they again had to seek re-election. Stockport gained 22 votes and was therefore re-elected. Despite an unsuccessful 1920–21 campaign that saw Stockport end the season bottom of the Second Division, which would normally have seen them face re-election however, they were placed in the new Third Division North. After winning five of their first six matches; along with going unbeaten from New Years Day 1921 to Easter Weekend 1922; Stockport set the standard for the division and gained their first Football League title when they beat Darlington in front of 18,500 fans at Edgeley Park. Albert Williams (the then manager) was presented with the trophy seven days later before the home game with Lincoln City. This title win began a remarkable coincidence which has occurred in each of Stockport's title winning seasons where Lincoln City have been the last opponents in each of those seasons. Joe O'Kane; who joined Stockport the previous season, was a major factor in the clubs promotion although he left the club at the end of the season. Once Stockport returned to Division 2, they struggled and survived an automatic relegation by one point. The 1923–24 season saw Stockport County finish 13th, one place above Manchester United. This is the only time in history Stockport has achieved better than Manchester United. During this campaign Stockport goalkeeper Harry Hardy was called up to play for the England national team and kept a clean sheet in a 4–0 win against Belgium. He is the only player to be capped at full level by England while on Stockport's books. Two seasons later (1925–26) Stockport returned to the bottom division after finishing bottom of the league and only picking up 25 points. Stockport finished 6th the next season (1926–27) but suffered a 2-point deduction and £100 fine for fielding an ineligible player after the registration documents for Joe Smith were not received by the Football League. Stockport closed out the 1920s in Division Three North with a 3rd-placed finish in 1927–28. Joe Smith was Stockport's and the division's leading goalscorer in this particular season contributing to 38 of Stockport's 89 goals. Stockport also finished second on two occasions, one in 1928–29; Where Stockport amassed 62 points, scored over 100 goals in a season and averaged 10,000 fans for the first time, it was a memorable season, but one that in the end had been disappointing after Stockport won nine of their last 11 matches it had still not been enough to win the league. Stockport also finished second the following season; 1929–30 with an even better record than in the previous season, finishing four points behind the champions Port Vale despite beating them 2–1 away on Christmas Day and 4–2 on Boxing Day, 1929. Frank Newton was Stockport's and the division's leading goalscorer in this particular season contributing to 36 of Stockport's 106 goals. From the start of the 1930s, Stockport County played in a home strip of white and black and were nicknamed the 'Lilywhites'. The 1933–34 season saw them achieve 115 goals. These included a 13–0 home win over Halifax Town on 6 January 1934; Joe Hill made his debut for Stockport scoring twice to making the score 2–0 at half time. Hill completed his hat trick on 51 minutes also Percy Downes make a notable performance scoring four of Stockport's goals on this day. This record victory still stands as a Football League record today. Over the course of the 1933–34 season Alf Lythgoe scored 46 goals for Stockport . Both of these records still stand in the club's history. Another first for Stockport was also seen during this season when Stockport's 2–1 home defeat to Crystal Palace in the second round of the FA Cup was shown on television . Stockport finished third in this season. The Main Stand of Edgeley Park, which in 1935 was made of wood, burned down in a fire, destroying all of Stockport County's records before 1935. Besides having to rebuild a significant section of the ground, the club had to piece together historical information. The current Main Stand, was built a year later in 1936 and officially opened by Charles Sutcliffe, then President of the Football League. In 1936–37 County won the Third Division North, gaining 60 points and 23 wins. Towards the end of this season, Stockport had a ten-game unbeaten run that included seven victories before a last-day title decider against Lincoln City in which more than 27,000 fans watched. The following season, Stockport finished 22nd out of 22 in the Second Division and were relegated to Division 3 (North) after only earning 31 points. During the 1939–40 season football was stopped following Britain's declaration of war and was not resumed until the end of World War II. This was because most British men were sent to the army. Stockport played only two matches in the 1939–40 season before war was declared, losing both and being bottom of the league. Regional league competitions were set up; appearances in these tournaments do not count in players' official records. Due to teams having a depleting number of players most teams resigned from football, the clubs that were left to complete used guest players to make up their numbers. The FA Cup was also suspended and replaced with the Football League War Cup. In the first war league after the outbreak of World War II (1940–41) Stockport finished in 35th place overall in the Northern Regional League after playing 29 games. League standings were calculated by goal average over the course of games played, with some teams playing more than others. In 1945–46, English football still did not have a football season; however, The FA Cup competition was resumed. Stockport was eliminated from the 1945–46 FA Cup in the first round after a 3–2 aggregate loss to Rochdale. The first post-war league season 1946–47 saw Stockport finish fourth in Division 3 (North) with 24 wins and 50 points. The 1950s brought little league success, but were notable for goal-scoring by Jack Connor, whose 140 goals in five seasons are still a club record. These included 13 hat-tricks (three of which were consecutive – once against Crewe Alexandra and twice against Chester), two instances of four goals in a match (against Workington and Carlisle United), and two of five goals in a match (against Bradford Park Avenue and the Tranmere Rovers). When the regional Third Divisions were to be combined into national Third and Fourth Divisions after the 1957–58 campaign, Stockport finished in the top half of the Third Division North and so were placed in the following season's national Third Division. Stockport spent one season at this level before the club was demoted. Stockport played in the first League Cup competition in 1960–61, beating Carlisle United in the first round, but the club was eliminated in the second round after a 3–0 defeat against Manchester City. In the 1964–65 FA Cup run Stockport were drawn against reigning Football League champions Liverpool FC at Anfield. Stockport footed the 4th Division table. Stockport pulled off a shock 1–1 draw at Anfield after deservedly taking the lead with enough chances to have won. Unfortunately the replay was a 0–2 home defeat after another excellent performance against top class opposition. Despite Stockport's ability to match the 1964–65 European Cup semi-finalist they finished bottom of the 4th division and survived re-election in the 1964–65 season. After finishing bottom of the league with 27 points, the club was re-elected by gaining 45 votes. During the 1964–65 season, then Stockport Chairman Vic Bernard re-introduced the royal blue strip, colours they still play in. Two seasons later Stockport returned to Third Division by winning the Fourth Division in 1966–67 after gaining 64 points. After the club was relegated in 1969–70, the 1970s and 1980s consisted of little other than mediocrity and struggling against re-election.In February 1984 Stockport competed in their first Associate Members' Cup match against Crewe Alexandra in a competition their chairman at the time' Dragan Lukic' helped create. The matched finished 2–2 after extra time and as so was decided in a penalty shoot-out; the first in Stockport's history. Stockport went on to lose 3–0 on penalties. The introduction of automatic promotion and relegation between the Football League and the Conference was not a good sign for Stockport, and in 1986–87 they had just six points from 13 games and faced a real prospect of non-League football, exemplified by being eliminated from the FA Cup by Caernarfon Town. Colin Murphy was brought in for his second spell as manager. Stockport gained 45 points from their final 31 games and survived, although Murphy left shortly after the end of the season. Danny Bergara was appointed as manager in March 1989, quickly transforming the team, and automatic promotion was gained in 1990–91. The next three seasons saw Stockport make the play-offs, but failed to result in another promotion. In March 1995 Bergara was sacked after an altercation with then-chairman Brendan Elwood, and Dave Jones was appointed manager in April of that year. A new all-seater, Cheadle End, holding just over 5,000 in capacity, was opened at the start of the 1995–96 season. Although this particular season was unremarkable, the club reached the third round of the FA Cup, where they faced holders Everton. Stockport reached a 2–2 draw with Everton at Goodison Park, and for the replay ten days later over 11,000 gathered at Edgeley Park to witness Everton's late winner in a 3–2 victory. The 1996–97 campaign proved to be the most successful in the club's history. They finished second in the Second Division and reached the semi-final of the League Cup, knocking out three Premiership teams (Blackburn Rovers, Southampton and West Ham United) on the way before losing to Middlesbrough 2–1 on aggregate. Before the start of the 1997–98 season, Dave Jones left for Southampton. Gary Megson left Blackpool to take over as manager and in his first season Stockport finished eighth, just two places off the playoffs to reach the Premiership – the club's best ever league placing. However, the following 1998–99 season saw Stockport finish 16th, winning just 3 of their final 14 matches. A 5–0 defeat at relegated Oxford United on the final day signaled the end of Megson's time at Edgeley Park. The club decided to promote from within and Andy Kilner was soon put in charge. He had an encouraging start to his management at County having defeated Manchester City, 2–1 at Maine Road; And by Boxing Day the club were sixth, holding a playoff spot. After their win over Manchester City, the team then went a club-record 19 games without a victory, eventually finishing the 1999–2000 season 17th, with two late wins helping stave off relegation. 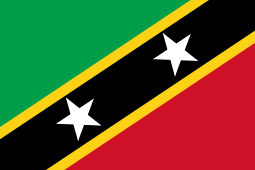 The 2000–01 season saw them again narrowly avoid relegation, finishing 19th overall. The 2001–02 season turned out to be the club's worst ever season at the time. With Stockport already bottom of the league, a 4–0 home defeat to Millwall saw manager Kilner sacked. Former England international Carlton Palmer was appointed in November 2001. Palmer subsequently failed to stop Stockport being relegated in 2001–02 or to build a team capable of challenging for a return the next season. The summer of 2003 saw the club change ownership, as Elwood sold the club to Sale Sharks owner Brian Kennedy in a move that would see Sale play their home games at Edgeley Park. A new company was created, called 'Cheshire Sport', which would have ownership of Stockport County, Sale Sharks and the Edgeley Park stadium. The 2003–04 season saw Palmer sacked after another poor start to the season, following home defeats to Hartlepool and Blackpool in the space of a week. John Hollins, who had been Director of Football during Palmer's reign, took over as caretaker manager, but was replaced full-time by former Northern Ireland manager Sammy McIlroy. Following more relegation worries, an 11-match unbeaten run saw the club again climb to safety at the end of the season. Sammy McIlroy continued as manager in the 2004–05 season; poor results led to his sacking and the appointment of Chris Turner one year later. 2005–06 saw Stockport County change owners again. After reportedly losing £4m, Cheshire Sports chairman Brian Kennedy handed ownership of the club to the Supporters Trust, whose aim was to rescue the club from revenue loss, eventually break even and turn Stockport County into a community based football club. However, another relegation followed, and Turner resigned after one year in charge after a 6–0 defeat to local rivals Macclesfield Town that left County five points adrift of safety and facing a third relegation in four years. Former player Jim Gannon was placed in charge, initially as caretaker-manager. He led the club to safety in 2005–06, and County sustained a promotion challenge the next season, eventually missing out on the League Two playoffs on goal difference. The club also set a new Football League record on 3 March 2007 when they beat Swindon Town 3–0, recording nine consecutive wins without conceding a goal. At the start of the 2007–08 season it was learned that former manager Danny Bergara had died. Stockport County continued their success, despite losing an FA Cup first round replay away to non-League Staines Town on penalties. The early months of 2008 saw Stockport equal a league record of eight consecutive away victories. Approaching the end of the season, they had an outside chance to qualify for promotion automatically but missed out, finishing the season in fourth place. However, after beating Wycombe Wanderers 2–1 on aggregate in the play-off semi-final, Stockport played Rochdale at Wembley in the final, coming from behind to secure a 3–2 victory and earn promotion to League One for the next season. During the 2008–09 season, Stockport defied the odds by challenging for a play-off place, but their form dipped during the final months of the season, which saw them slip to mid-table. Gannon was approached by Brighton & Hove Albion and the approach was accepted by Stockport, but after talks with the chairman of Brighton, Gannon rejected the job and stayed at Stockport. On 30 April 2009, Stockport County was placed into administration following a battle to repay creditors. This followed a petition by a creditor to repay a loan of around £300,000. The club had also struggled to repay a tax debt of £250,000 to Her Majesty's Revenue and Customs. On 16 December 2009 the team's training ground was put up for sale. On 12 June 2009, Leonard Curtis, administrator of Stockport County Football Club, announced that they had agreed to terms with the Melrose Consortium for the sale of the club. Paul Reeves, one of the joint administrators, commented that, "Whilst a deal has been agreed, it is subject to the Melrose Consortium obtaining landlord approval. This is a positive step to safeguarding the club's future." The Melrose Consortium, consisting of "a group of businessmen with a sporting background" headed by ex Manchester City player Jim Melrose said, "We look forward to developing a fruitful relationship with Sale Sharks and Stockport Metropolitan Borough Council which will provide the basis for a successful future for Stockport County Football Club." The immediate aims of the Melrose Consortium were described as being to "...guarantee football at Edgeley Park next season and to secure the services of redundant manager, and Stockport legend, Jim Gannon". On 3 July 2009 Administrators agreed to a Company Voluntary Arrangement (CVA) with previous shareholders and creditors. Gannon took over as manager at Scottish Premier League side Motherwell, causing Stockport fans to worry that he would be poaching Stockport's young players in the forthcoming weeks. Gary Ablett, former manager of Liverpool reserves, was appointed manager on 8 July 2009 following talks with the (prospective) new owners, although they had still not taken over, and in fact never did take over the club. In March 2010 it was announced that a new consortium, the '2015 Group', had been given exclusivity to work towards a takeover of the club. The 2015 Group was approved by the Football League at its May 2010 meeting, On 17 June 2010 at an 11pm press conference, the takeover of Stockport County by the group was announced. It was also revealed that Ablett had been relieved of his duties as manager after one season in charge, which saw the club relegated from the third division of the English Football League, (League One), with five wins from 46 league matches. It was widely reported that Gannon, who was made redundant in April 2009, would return to the club, but he decided to take a break from the game. Following the takeover of the club by the 2015 Group, the consortium pledged to "rebuild the club from top to bottom". On 12 July 2010, former Carlisle United manager Paul Simpson was unveiled as Ablett's successor as the new manager of the club at a press conference at Edgeley Park. Simpson's assistant manager was Peter Ward, who was previously assistant manager at the club between 2005 and 2009 under Gannon, and who also played over 100 games for the club in the 1990s. On 4 January 2011 Simpson was sacked, his place taken by Peter Ward on a caretaker basis. Ward was replaced by Ray Mathias after 12 games and two wins. Stockport's relegation from the Football League after 106 years was confirmed after a 2–0 away defeat against Crewe Alexandra. The 2011–12 season started with the team appointing Ray Mathias as permanent manager. However, before any matches took place, he was replaced by former Liverpool, Newcastle United, Bayern Munich and German international midfielder Dietmar Hamann. This was after Liverpool-based businessman Tony Evans attempted an ultimately unsuccessful takeover of the club. Hamann did poorly, winning just three games out of 19, and resigned in November citing the failed takeover as the reason. He was replaced by Gannon, who returned to the club as Director of Football and First Team Manager through the 'Your Town Your Team' Group. In Gannon's first match back at the club, the team lost a match 2–1 to joint-leaders Fleetwood Town, who achieved a record attendance in the fixture at Highbury. Gannon managed Stockport to their first back-to-back wins in over three years, since his last stint as manager, with successive 1–0 victories over Wrexham and Darlington. Gannon steered Stockport away from the drop zone, winning eight of the last 15 league games – when the side had only managed to win nine games throughout the whole of the 2010–11 campaign – to finish 16th in the final table. Gannon again focused on youth development, inducing young players such as Danny Whitehead, Cameron Darkwah, Danny Hattersley and Ian Ormson into the starting eleven. County regained sole tenancy of their Edgeley Park stadium for the first time in nine years from the beginning of the 2012–13 season, after Sale Sharks relocated for a second time, this time sharing with Salford City Reds at Barton. On 15 January 2013 former fcbusiness magazine editor Ryan McKnight was named as the new Chief Executive Officer at the club, becoming the youngest CEO in UK football. Fourteen months into his second spell at Edgeley Park and with County in the relegation zone, Gannon was fired as Stockport County boss following the 3–1 home defeat by Mansfield Town on 16 January 2013. He was replaced by Darije Kalezić, who initially saw an upturn in results, but left the position himself two months later following a poor run that left the club in serious danger of relegation to the Conference North. Ian Bogie in turn succeeded Kalezić, but was unable to turn the club's form around, and they were relegated to the Conference North on the final day after a defeat to title challengers Kidderminster Harriers. Former Vice-Chairman Spencer Fear made an offer to the shareholders in later August 2013, claiming that he would "write off his loans to the club, in exchange for the remaining shareholders to do likewise". The board took this proposal on board and stated it was a beneficiary of the football club. Stockport gained one point from their first four games of the 2013–14 season, which led to Bogie's resignation as manager on 31 August, with the club second-bottom of the Conference North. Alan Lord then took charge of the team in a caretaker capacity. Ryan McKnight announced his resignation from the position of CEO at the football club on 8 April 2014, stating he would leave in early May 2014. Alan Lord remained in the manager's position until he stepped down to become the club director of football, three games before the end of the 2014–15 season. In the summer of 2015 Neil Young was named as Stockport's new permanent manager after having previous successes and experience in the Conference North. Young was sacked on 12 January 2016 (along with other members of his backroom staff) following a poor run of results. A week later Jim Gannon returned to Edgeley Park for a third spell as manager, following a successful period at Northwich Victoria. Stockport County's traditional kit colours are blue and white, although they have played in other colours throughout their history. Originally competing in blue and white striped jerseys and white shorts, they experimented with red and white stripes in the early 1900s and from the mid-1930s to mid-1960s played in white jerseys and black shorts. No set pattern has been established for the club's use of blue and white as main colours, as they have played at various times in a white jersey with a blue band and blue shorts and a blue jersey with white pin stripes and white shorts. They made a short experiment with an Argentina-style kit, light blue and white stripes with black shorts, after the 1978 World Cup. 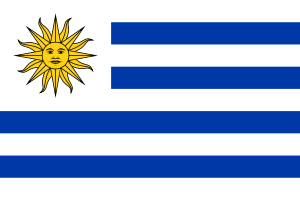 This was abandoned after the outbreak of the Falklands War, and the club returned to blue and white striped tops with blue shorts in the 1980s. County marked their 125th anniversary during 2008 by bringing in a third kit – a gold colour with black trim. The kit was worn on 17 occasions, all away trips. The strip was retired 'undefeated' at the end of the year, having been worn for 13 victories and 4 draws. The kit was also worn during a match against Chester City which was abandoned after 59 minutes. The club crest, which was used for many years until 2010 when the club exited administration, was based on the achievement of arms of the Metropolitan Borough of Stockport. It was altered in 2006 to resemble the town's arms more closely, including the Latin motto Animo et Fide, which loosely translated, means With Courage and Faith. The blue shield is taken from the coat of arms of the 'de Stokeport' family, from whom Stockport derives its name. The twin-towered castle above the shield is Stockport Castle, which stood until 1775. After the completion by the 2015 Group takeover of the club, a new crest was adopted. It was still based on the Stockport coat of arms, though the Animo et Fide motto was removed, along with a patch of green at the base of the badge; the flag of Cheshire, featuring a sword and three wheatsheaves, replaced the golden lozenges and crosslets in the shield. The medals hanging from the lion's rampant (which represented Cheshire and Lancashire, owing to Stockport's location astride the Mersey which forms the historic border between the two counties) were removed. It also saw the return of a football on the shield. This change was made in part because as of the 2010–11 season, Stockport County was sponsored by the Metropolitan Borough Council. The crest was altered in 2011 to re-include the town motto. The new version added two white ribbons – one at the top, with Animo et Fide, and one at the bottom with Stockport County F.C.. In addition, the football was again removed from the shield. The Stockport County Supporters' Co - Operative used the blue on white cross symbol from the 1978 badge as the main identifier in their company logo. County's kit was supplied by local manufacturer Umbro who supplied all three of County's kit for the 2013–14 season, replacing Nike, thus making County the only senior club in the UK to wear the Umbro strip in the 2013–14 season. For the start of the 2014–15 season, County again changed their kit manufacturer, this time from Umbro to Spanish-based manufacturer Joma which supplied County with a new Home, Away and Third kit along with training wear. Heaton Norris Rovers originally played home matches at the Heaton Norris Recreation Ground, then at various locations in Stockport until settling at a park on Green Lane, Heaton Norris, in 1889. The nearby Nursery Inn served as the team's home, with players using a barn as changing rooms. Green lane remained the clubs home for its first two seasons in the Football League. In 1902 the club required a larger ground and moved to Edgeley Park, then home of the rugby league club Stockport, who went out of business three years later. Green Lane was retained for use by the club's reserve team, and one further first team game was played at the ground on 18 April 1903 when Edgeley Park was being used by the rugby club. The site was later used for housing. Stockport County have played home games at Edgeley Park since the start of the 1902–03 season, celebrating the centenary in 2002. In late 2000 the chairman considered moving the club to Maine Road, the former home of rivals Manchester City. The potential move was unpopular with supporters, and protests were staged after it was suggested that the club would change its name to Man-Stock County after the move. Ultimately Manchester City Council decreed that Sale Sharks would make better tenants. Maine Road has since been demolished to make way for a housing estate and Edgeley Park was then shared with Sale whose Parent Company Cheshire Sports owned the ground. There was one again rumour that Stockport would leave Edgeley Park in 2012; which was dismissed by then chairman Lord Peter Snape, before Sale Sharks confirmed that they would be moving to Salford City Reds' new stadium. This meant that Stockport County would again be the only tenants at Edgeley Park, having sole use of the pitch and various revenue-generating aspects of the stadium. The Stockport County board then negotiated a 65% rent reduction in November 2012. On 23 May 2012, it was announced that Stockport County were to rename the Main Stand "The Danny Bergara Stand" in honour of the late Danny Bergara who managed the team during a successful period in the 1990s. In the summer of 2015, Stockport Metropolitan Borough Council purchased the stadium in order to prevent it from being demolished and redeveloped. After a plea from fans to safeguard the stadium, an emergency council meeting was held and the stadium was purchased for £2 million. It is currently leased back to the football club. With both Manchester United and Manchester City around 7 miles (11 km) from Edgeley Park, Stockport County has always struggled for local support. During the mid-1960s, the Football League introduced a minimum admission price for all clubs in all four divisions, attempting to help boost revenue for lower clubs. It had the desired effect only in small towns miles from big city teams. It had the opposite effect in places like Stockport, where people had the choice of paying the same price on Saturday afternoon to stand on the terraces and watch Stockport or to watch Manchester City or Manchester United. Stockport devised a solution, moving all their home games to Friday evening kick-offs, which generated larger crowds and extra business in surrounding pubs and restaurants. Still, during the 1998–99 season, crowds averaged around 20,000 less than local rivals Manchester City, who were a division below Stockport at the time. In 2004, when the club notably attracted a crowd of more than 20,000 for one of its tour matches in China. Both Manchester United and Barcelona achieved less in their subsequent tour matches in the country in the same year. Stockport were watched by 22,000 in Yingkou against their then sister side Stockport Tiger Star whom they beat 4–0. It is possible that this high attendance was a result of Stockport County's association with their affiliate team, and Tiger Stars' name change to include 'Stockport' two years previously. Although the club has had notable defeats from 2000–01 onwards, crowds have continued to be healthy. During the 2005–06 season, home attendances (that is, given attendances minus away support) increased slightly on the season before, helped by a 10,006 crowd against Carlisle on the final day of the season. That game in particular attracted a large crowd as the town of Stockport supported its team at Edgeley Park. If Stockport had lost that particular game, they would have been relegated for the second successive season, and more significantly, would have been relegated from the Football League for the first time, an embarrassment as the team has competed continuously in the Football League since 1900. Stockport eventually drew the game with Carlisle and survived the drop, while Carlisle themselves gained the league championship. The 2006–07 season saw the club average the fourth highest average attendance in League Two, and was the highest average since the club's last season in the First Division. The 2007–08 season saw a further increase in attendance. Away support increased due to a combination of lower ticket prices, improved results and the proximity of sides such as Bury, Rochdale and Macclesfield Town. During these games Stockport's away support outnumbering home supporters on a number of occasions. Stockport County had an average away attendance of over 900, the highest in the league. Only two teams in the league above surpassed this figure. 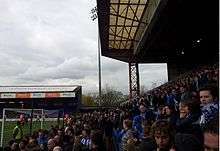 Despite the club's significant fall from League One to the Conference North, Stockport still attracted a large following, home attendances totalling 66,356 for the 2014–15 season and an average of 2,655, despite a poor 11th-place finish. The following season the club set a National League North record league attendance with 4,797 people attending County's home fixture with FC United on 5 December. Vocally, the support from Stockport fans has often been cited by managers and players as inspirational and a huge boost to the team during play, with their influence likened to having a twelfth player on the field. Stockport supporters often receive praise from other players and managers, both at home and away, for their vocal support. Between the 2006–07 and 2009–10 seasons the squad number 12 was allocated to the 'Blue & White Army', in reference to the supporters being the team's 12th man on matchdays. However, for the 2010–11 season, the number reverted to one of the players. Stockport fans also have a wide variety of songs, being ranked sixth on FootballChants.org for the number of individual chants. Stockport County fans are known for singing the club's anthem, "The Scarf My Father Wore", and similar to Tottenham Hotspur fans, the "Blue & White Army". In this chant the supporters sing the manager's name, followed by "blue & white army", as the team play in blue and white. 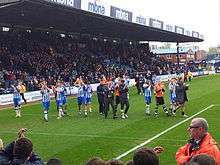 Songs of the Cheadle End was a CD that a group of Stockport County fans recorded, containing 46 popular fan chants that spanned over four decades. The CD also contained the club's anthem which was re-recorded in 2011. Some famous Stockport County fans include BDO darts player Tony O'Shea, singer-songwriter Daz Sampson, Robin Richards from the band Dutch Uncles and bassist Charlie Salt from Blossoms. O'Shea writes an article in the club programme every home match and also wears the club colours in all of his televised darts matches. Sampson became a life member of the Stockport County Supporters Trust after he released "The County Song", which pays tribute to Stockport County's Football League record of nine consecutive wins without conceding a goal. The Stockport County Supporters Co-Operative (Formerly The Stockport County Supporters Trust) is the other active supporters' group where there is a £12 annual membership fee. The Supporters Co-Operative's aim is to give the club's greatest asset – the fans – a voice; as well as a stake in the football club through its Guardian Account. The Supporters Co-Op also assists in running the Stockport County Appearance Number (SCAN) Scheme where every player who has played a senior professional game is recognised with a unique framed certificate and a number which show their position in the list of players to make their debut for the club. "Stockport County FC is keen to maintain good relations with all clubs – including those which its supporters don't like very much. So you'll have to ask County fans to name their rivals." As the two nearby Manchester clubs have rarely been in the same division as Stockport, historically there has been little rivalry with either club. However, the rivalry between Stockport County and Manchester City took form between 1997 and 2002, when the two clubs spent three out of five seasons in the same division and during the 1998/99 season, Stockport were a division above City. The 1997–98 season saw Stockport County and Manchester City meet at Edgeley Park in a Football League game for the first time in 88 years; Stockport County were victors, beating Manchester City 3–1, with Paul Cook, Alun Armstrong and Brett Angell on the scoresheet for County. Manchester City inflicted a 4–1 defeat on Stockport County at Maine Road in the return fixture; however, this didn't prevent City from being relegated to the third tier. Rivalries were renewed in 1999–2000 following Manchester City's promotion back to the second tier. Stockport County beat Manchester City at Maine Road for the first time in history (1999–2000) thanks to goals from former City youngster Alan Bailey and County legend Tony Dinning. Manchester City were famously defeated once more by Stockport County in 2001–02, when 2 late goals from John Hardiker handed bottom of the table Stockport victory, and in the process City were prevented from gaining 100 points in their quest for the Division One title. Stockport County and Manchester City met six times between 1997 and 2002, with Stockport County winning three times, losing once and drawing twice. The defeats suffered at the hands of County clearly touched a raw nerve with many Manchester City supporters, some of whom have celebrated County's downfall on the 'bluemoon' forum. The rivalry with City is made more interesting by the fact that Stockport is a Manchester City hotbed. In their days in the Football League the club has had local rivalries with Oldham Athletic, Crewe Alexandra, Bury, Rochdale  and Macclesfield Town. For historical reasons, County's main rivalries are with more distant neighbours Burnley and Stoke City. The rivalries with Burnley  and Stoke City  are largely fueled by meetings in the early 1990s, including the Football League play-offs final and Football League Trophy final being played against each club respectively – both of which Stockport lost. According to the last Football Fans Census in 2003, Burnley, Manchester City and Stoke City are cited as Stockport County fans' biggest rivals. At present, their closest geographical rivals would be Stalybridge Celtic, Curzon Ashton, F.C. United of Manchester and Altrincham, however, there appears to be no evidence of any rivalry emerging with the any of aforementioned clubs. As of 23 May 2016. This list contains the names of all past players/club staff that have been inducted into the Stockport County Hall of Fame. 1 ^ Steve Bellis and George Hudson are responsible for the day-to-day running of the football club in a voluntary capacity. Honours are correct as of the end of the 2015–16 Season. Lowest number of paying spectators: 13 vs. Leicester City (at Old Trafford, 7 May 1921) also a Football League record*. *It is estimated that between 1,000 and 2,000 people actually attended the match; Manchester United and Derby County had played immediately beforehand, and some spectators for that match had stayed on to watch the Stockport match for free. However, only 13 people paid at the gate to watch the Stockport match by itself. Stockport County hold the record for winning nine Football League matches without conceding a goal. This record ran from January to March 2007, when manager Jim Gannon led the club to the best form shown by a football club in Football League history. This final match in this nine match run was a 3–0 home win against Swindon Town. Wayne Hennessey, who was on loan to Stockport at the time from Wolves, kept all the clean sheets in his first nine games in professional football. He made his footballing debut against Boston United where Stockport won 2–0. During this time, Hennessey received the League Two Player of the Month Award, The other players involved in matches during the record-breaking run are as follows: Robert Clare, Michael Rose, Ashley Williams, Gareth Owen, Stephen Gleeson, Jason Taylor, Adam Griffin, David Poole, Damien Allen, Anthony Pilkington, Tony Dinning, Dominic Blizzard, Liam Dickinson, Adam Proudlock, Tes Bramble and Anthony Elding. 1 2 3 4 Freeman, Peter (1999). Stockport County – From the Nursery. ISBN 0-9537558-0-0. 1 2 3 4 5 6 7 8 "A brief history of Stockport County". stockportcounty.com. Retrieved 8 September 2013. 1 2 3 4 "Stockport County's home since 1902". stockportcounty.com. Retrieved 17 February 2015. 1 2 3 4 5 Moor, Dave (4 April 2012). "Background". Historical Kits. Retrieved 4 April 2012. ↑ "League Two Table 2010–11". The Football League. Archived from the original on 12 October 2013. Retrieved 11 September 2013. ↑ "Conference Premier Table 2012-13". Statto. Archived from the original on 18 July 2014. Retrieved 9 August 2015. ↑ "Lancashire league 1899/00". footballsite.co.uk. Retrieved 16 April 2012. ↑ "Division 2 1903/04". footballsite.co.uk. Retrieved 11 April 2012. ↑ Abbink, Dinant (2 May 2007). "England – Lancashire Combination". Rec.Sport.Soccer Statistics Foundation. Retrieved 11 April 2012. ↑ "Midland League 1904/05". footballsite.co.uk. Retrieved 11 April 2012. 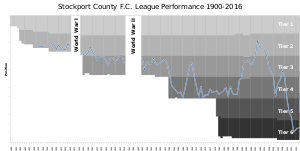 ↑ "Stockport County Record while in the Football League". footballsite.co.uk. Retrieved 16 April 2012. ↑ "Division 2 1905/06". footballsite.co.uk. Retrieved 16 April 2012. ↑ "Division 2 1912/13". footballsite.co.uk. Retrieved 11 April 2012. ↑ "Division 2 1920/21". footballsite.co.uk. Retrieved 11 April 2012. 1 2 3 4 5 6 7 8 Freeman, Peter; Harnwell, Richard (1994). Stockport County: A Complete History. Derby: Breedon Books. ISBN 1-873626-72-X. ↑ Brennan, Phil (16 May 2012). "Top Hatters' Silver Salvo". Stockport Express. Stockport. p. 56. ↑ "Division 3 (North) 1921/22". footballsite.co.uk. Retrieved 16 April 2012. ↑ "DIVISION 2 1922/23". footballsite.co.uk. Retrieved 16 April 2012. ↑ "DIVISION 2 1923/24". footballsite.co.uk. Retrieved 16 April 2012. ↑ "Internationals". stockportcounty.com. Retrieved 13 August 2015. ↑ Naylor, Davey (4 April 2012). "England Stats – Harry Hardy". englandstats.com. Retrieved 13 August 2015. ↑ Brennan, Phil (16 May 2012). "England Hero Harry Is One of a Kind". Stockport Express. Stockport. p. 56. ↑ "Hardy England Cap back at Edgeley Park". stockportcounty.com. Retrieved 14 July 2013. ↑ "Division 2 1925/26". footballsite.co.uk. Retrieved 16 April 2012. ↑ County "Did you know? 29 POINTS DEDUCTIONS, DEMOTIONS and EXPULSIONS........" Check |url= value (help). footballsite.co.uk. Retrieved 13 August 2015. 1 2 "DIVISION 3 (North) 1927/28". footballsite.co.uk. Retrieved 13 August 2015. ↑ "DIVISION 3 (North) 1928/29". footballsite.co.uk. Retrieved 13 August 2015. 1 2 "DIVISION 3 (North) 1929/30". footballsite.co.uk. Retrieved 13 August 2015. 1 2 3 4 5 6 7 8 9 10 11 12 13 14 "Records". stockportcounty.com. 29 August 2013. Retrieved 29 August 2013. 1 2 Brennan, Phil (30 May 2012). "Netbusters and Record Breakers". Stockport Express. Stockport. p. 59. ↑ "Division 3(North) 1933/34". footballsite.co.uk. Retrieved 16 April 2012. ↑ "DIVISION 3 (North) 1936/37". footballsite.co.uk. Retrieved 3 June 2012. ↑ Brennan, Phil (6 June 2012). "Final day drama in 1937". Stockport Express. Stockport. p. 58. ↑ "DIVISION 2 1937/38". footballsite.co.uk. Retrieved 3 June 2012. ↑ "DIVISION 3 (North) 1939/40". footballsite.co.uk. Retrieved 22 June 2012. ↑ Becker, Matt (15 January 2015). "Keep Calm, Carry on and Play Soccer: The Football League War Cup". Paste Magazine. Georgia,USA: Paste Magazine. Retrieved 28 August 2015. ↑ Kungler, Peter (15 February 2003). "England 1940/41". Rec.Sport.Soccer Statistics Foundation (RSSSF). Retrieved 13 August 2015. ↑ McColl, Brian (2014). A Record of British Wartime Football. p. 115. ISBN 978-1-291-84089-6. ↑ "F.A. Cup 1945/46". footballsite.co.uk. Retrieved 22 June 2012. ↑ "DIVISION 3 (North) 1946/47". footballsite.co.uk. Retrieved 22 June 2012. ↑ Brennan, Phil (13 June 2012). "Leading scorer Connor an all-time County great". Stockport Express. Stockport. p. 58. ↑ "DIVISION 3 (North) 1957/58". footballsite.co.uk. Retrieved 22 June 2012. ↑ "DIVISION 3 1958/59". footballsite.co.uk. Retrieved 22 June 2012. ↑ "LEAGUE CUP 1960/61 Results". footballsite.co.uk. Retrieved 8 September 2013. ↑ "DIVISION 4 1964/65". footballsite.co.uk. Retrieved 22 June 2012. ↑ "DIVISION 4 1966/67". footballsite.co.uk. Retrieved 22 June 2012. ↑ "Stockport sack Bergara". The Independent. Archived from the original on 5 July 2015. Retrieved 15 April 2012. ↑ "Dave Jones factfile". Telegraph. London. 3 January 2001. Retrieved 15 February 2015. ↑ "Everton v Stockport County, 07 January 1996". 11v11.com. Retrieved 15 February 2015. ↑ "Stockport County v Everton, 17 January 1996". 11v11.com. Retrieved 15 February 2015. ↑ "DIVISION 1 1997/98". footballsite.co.uk. Retrieved 15 February 2015. ↑ Walker, Paul (26 June 1999). "Megson sacked by Stockport". The Independent, 26 June 1999. London. Retrieved 15 February 2015. ↑ "Championship 1999/2000 " 18. Round". worldfootball.net. Retrieved 30 August 2015. ↑ "Championship 1999/2000 " 24. Round". worldfootball.net. Retrieved 30 August 2015. ↑ "DIVISION 1 1999/2000". footballsite.co.uk. Retrieved 15 February 2015. ↑ "DIVISION 1 2000/01". footballsite.co.uk. Retrieved 15 February 2015. ↑ Wilson, Andy (30 October 2001). "Struggling Stockport fire Kilner by unilateral consent". The Guardian. Retrieved 30 August 2015. ↑ "Stockport appoint Palmer". Telegraph. London. 6 November 2001. Retrieved 15 February 2015. ↑ "Palmer named as Stockport boss". The Guardian. 6 November 2001. Retrieved 15 February 2015. ↑ Johnson, William (6 November 2001). "Stockport gamble on outspoken Palmer". Telegraph. Retrieved 9 August 2015. ↑ "DIVISION 1 2001/02". footballsite.co.uk. Retrieved 30 August 2015. ↑ "DIVISION 2 2002/03". footballsite.co.uk. Retrieved 30 August 2015. ↑ "Sharks to merge with Stockport". BBC Sport. 2 May 2003. Retrieved 15 February 2015. ↑ "Stockport sack Palmer". BBC News. Retrieved 30 August 2015. ↑ "Palmer's farewell shot". Manchester Evening News. Retrieved 30 August 2015. ↑ "McIlroy quits NI for Stockport". BBC Sport. Retrieved 9 August 2015. ↑ "Turner named as Stockport manager". BBC Sport. Retrieved 9 August 2015. ↑ "No more cash for Sharks and County". BBC News. 22 November 2005. Retrieved 9 August 2015. ↑ "Manager Turner leaves Stockport". BBC Sport. Retrieved 9 August 2015. ↑ "Gannon unveiled as Stockport boss". BBC Sport. Retrieved 9 August 2015. ↑ "LEAGUE 2 2005/06". footballsite.co.uk. Retrieved 9 August 2015. ↑ "LEAGUE 2 2006/07". footballsite.co.uk. Retrieved 15 February 2015. 1 2 3 4 "Stockport County : Records". Statto. Archived from the original on 3 July 2015. Retrieved 9 August 2015. ↑ "Stockport hero Danny Bergara dies". BBC Sport. 26 July 2007. Retrieved 9 August 2015. ↑ "F.A. Cup 2007/08 Results". footballsite.co.uk. Retrieved 15 February 2015. ↑ Oliver, Pete (19 March 2008). "Stockport boss has young vision". BBC News. Retrieved 9 August 2015. ↑ "LEAGUE 2 2007/08". footballsite.co.uk. Retrieved 15 February 2015. ↑ "County win 2–1 on aggregate". Manchester Evening News. 17 May 2008. ↑ Fletcher, Paul (26 May 2008). "Stockport 3–2 Rochdale". BBC Sport. Retrieved 20 June 2009. ↑ Leach, Conrad (27 May 2008). "Dickinson strike sends Stockport into raptures". The Independent, 27 May 2008. London. Retrieved 4 May 2010. ↑ "Gannon rejects Brighton approach". BBC Sport. 26 February 2009. Retrieved 20 June 2009. ↑ "Stockport go into administration". BBC Sport. 30 April 2009. Retrieved 20 June 2009. ↑ "Stockport enter administration after failing to pay creditors". The Guardian. 30 April 2009. Retrieved 8 September 2013. ↑ "Industry: Stockport County FC enter administration". insolvencynews.com. 3 May 2009. Retrieved 12 April 2011. ↑ Dawson, Rob (16 December 2009). "County's Manor up for sale". Manchester Evening News. Retrieved 20 February 2012. ↑ "Deal agreed for Stockport buy-out". BBC Sport. 12 June 2009. Retrieved 20 June 2009. ↑ Gripper, Ann (12 June 2009). "Stockport set to be rescued by sale to Melrose consortium". Mirror. Archived from the original on 7 June 2012. Retrieved 8 September 2013. ↑ "Ex-City star Jim Melrose set to complete takeover of Stockport after cash-strapped League One side exit administration". Daily Mail. 6 July 2009. Retrieved 8 September 2013. ↑ Dawson, Rob (8 July 2009). "Ablett named County boss". Manchester Evening News. Retrieved 22 February 2012. ↑ "Second group in bid for Stockport". Manchester Evening News. 12 January 2013. Retrieved 30 August 2015. ↑ "League One 2009/10". footballsite.co.uk. 29 May 2010. Retrieved 8 September 2013. ↑ Dawson, Rob (23 June 2010). "Nightmare ends with the dawn of new era". Stockport Express. Retrieved 23 March 2012. ↑ "Paul Simpson determined to turn around Stockport County after turning down Libya job". Daily Mail. 12 July 2010. Retrieved 8 September 2013. ↑ "Crewe 2–0 Stockport". BBC Sport. 30 April 2011. Retrieved 30 August 2015. ↑ "Mathias chosen for Hatters job". Sky Sports. 25 May 2011. Retrieved 8 September 2013. ↑ "Dietmar Hamann takes over as Stockport County boss". BBC Sport. 5 July 2011. Retrieved 8 September 2013. ↑ "Tony Evans resigns directorship of Stockport County". BBC Sport. 5 July 2011. Retrieved 8 September 2013. ↑ "Dietmar Hamann resigns as Stockport County manager". BBC Sport. 7 November 2011. Retrieved 7 November 2011. ↑ "Jim Gannon appointed Stockport County director of football". BBC Sport. 15 November 2011. Retrieved 8 September 2013. ↑ "Fleetwood 2–1 Stockport". BBC Sport. Retrieved 8 September 2013. ↑ "Stockport 1–0 Wrexham". BBC Sport. Retrieved 8 September 2013. ↑ "Darlington 0–1 Stockport". BBC Sport. Retrieved 8 September 2013. ↑ "Stockport County 2011–2012 : English Conference Premier Table". Statto. Archived from the original on 3 July 2015. Retrieved 9 August 2015. 1 2 Collins, Ben (4 April 2012). "It's business as usual for County as Sale move out". Manchester Evening News. Retrieved 4 April 2012. 1 2 "Sale Sharks confirm groundshare with Salford City Reds". BBC Sport. 4 April 2012. Retrieved 29 August 2015. ↑ "Stockport County: Ryan McKnight named chief executive". BBC Sport. 15 January 2013. Retrieved 8 September 2013. ↑ "Stockport County Appoint Former fcbusiness Editor as CEO". 15 January 2013. ↑ "Stockport County: Jim Gannon sacked after 14 months in charge". BBC Sport. 16 January 2013. Retrieved 8 September 2013. ↑ "Stockport County Relieve Gannon of Duties". conference-league-clubs.co.uk. 16 January 2013. Retrieved 16 January 2013. ↑ "Darije Kalezić appointed first-team manager". stockportcounty.com. 24 January 2013. Retrieved 8 September 2013. ↑ "Kalezic leaves Edgeley Park". stockportcounty.com. 20 March 2013. Retrieved 8 September 2013. ↑ "Ian Bogie named new County manager". stockportcounty.com. 20 March 2013. Retrieved 8 September 2013. ↑ "Kidderminster 4 – 0 Stockport". BBC Sport. 20 April 2013. Retrieved 8 September 2013. ↑ "Boardroom Statement regarding writing off loans". stockportcounty.com. 28 August 2013. Retrieved 8 September 2013. ↑ "Board Statement regarding Ian Bogie's resignation". stockportcounty.com. 31 August 2013. Retrieved 8 September 2013. ↑ "Club Statement: Ryan McKnight". stockportcounty.com. 8 April 2014. Retrieved 8 April 2014. ↑ "Club Statement: Regarding Alan Lord's Position". stockportcounty.com. 13 April 2015. Retrieved 9 August 2015. ↑ "Stockport County boss Alan Lord steps down at Edgeley Park". Manchester Evening News. 14 April 2015. Retrieved 9 August 2015. ↑ "Neil Young named new manager of Stockport County". stockportcounty.com. Retrieved 16 May 2015. ↑ Browne, Gavin (5 March 2015). "Stockport County possess 2020 vision". Manchester Evening News. Retrieved 12 August 2015. ↑ "Moving Forward". stockportcounty.com. 28 February 2015. Retrieved 12 August 2015. ↑ "Moving Forward Document" (PDF). stockportcounty.com. March 2015. Retrieved 12 August 2015. 1 2 Fitzgerald, Todd (24 June 2015). "Stockport council 'set to pay around £2m' to save Edgeley Park football ground from demolition". Manchester Evening News. Retrieved 9 August 2015. 1 2 Scapens, Alex (2 August 2015). "Council complete deal to buy Stockport County's Edgeley Park". Manchester Evening News. Retrieved 9 August 2015. 1 2 Moor, Dave (8 September 2013). "Kit History". historicalkits.co.uk. Retrieved 8 September 2013. ↑ Moor, Dave (9 September 2013). county "Coca Cola League Two 2007 – 2008" Check |url= value (help). Historical Kits. Retrieved 9 September 2013. 1 2 Moss, John (28 April 2009). "Stockport – Explanation of the Arms of Stockport". manchester2002-uk.com. Retrieved 29 August 2015. ↑ "STOCKPORT CASTLE". Historic England. 29 August 2015. Retrieved 29 August 2015. ↑ Moor, Dave (9 September 2013). 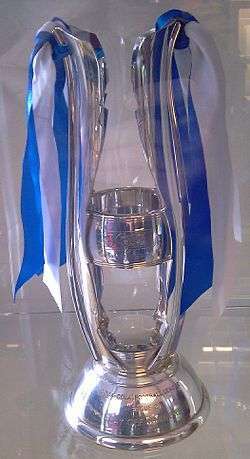 "Npower League Two 2010 – 2011". Historical Kits. Retrieved 9 September 2013. 1 2 "New Kit Deal Agreed". stockportcounty.com. 9 May 2013. Retrieved 8 September 2013. 1 2 3 Browne, Gavin (26 July 2014). "County hope they're dressed for success". Manchester Evening News. Manchester. Retrieved 16 September 2014. 1 2 "Robinsons sponsor new alternate away strip". stockportcounty.com. 9 July 2014. Retrieved 9 July 2014. 1 2 Browne, Gavin (9 July 2014). "Kit deal sees County go back to the future". Manchester Evening News. Manchester: stockportcounty.com. Retrieved 22 July 2015. ↑ "We're not bitter". Manchester Evening News. 4 September 2007. Retrieved 22 July 2015. ↑ "County Kit Sponsors Diadora Go Bust". vitalfootball.co.uk. 10 July 2009. Retrieved 22 July 2015. 1 2 "Stockport County new 07/08 diadora home football kit". footballshirtculture.com. 1 August 2007. Retrieved 22 July 2015. 1 2 "New County kit unveiled". Manchester Evening News. 22 July 2009. Retrieved 22 July 2015. ↑ "Home Shirt Sponsor Unveiled". stockportcounty.com. 1 July 2013. Retrieved 16 September 2014. ↑ "Stockport County sign new sponsorship deal". Cheshire Today. 18 June 2013. Retrieved 22 July 2015. ↑ Thompson, Sam (1 July 2013). "Record-Breaking Kit Launch". stockportcounty.com. Retrieved 8 September 2013. ↑ "New County Kit Unveiled". stockportcounty.com. 15 July 2015. Retrieved 22 July 2014. ↑ "TCM returns to Stockport County". stockportcounty.com. 29 July 2015. Retrieved 29 July 2014. ↑ "Robinson's sponsored alternate away shirt supports Michelle". stockportcounty.com. 22 July 2015. Retrieved 22 July 2014. 1 2 Smith, Paul; Smith, Shirley. The Ultimate Directory of English & Scottish Football League Grounds Second Edition 1888–2005. Yore Publications. p. 61. ISBN 0954783042. ↑ "Edgeley Park". stockportcounty.com. Retrieved 8 September 2013. ↑ "Stockport County Football Club – History". talkfootball.co.uk. Retrieved 29 August 2015. ↑ Espley, Dave (February 2001). "Man overboard". When Saturday Comes. Retrieved 29 August 2015. ↑ "Sale step closer to Maine Road". BBC Sport. 4 December 2000. ↑ "Sale to merge with Stockport". ESPN. 2 May 2003. Retrieved 29 August 2015. ↑ "Chairman Lord Snape says County will not leave Stockport". BBC Sport. 25 January 2012. Retrieved 25 September 2015. ↑ "Boardroom Statement – Cheshire Sport and County agree Edgeley Park Deal". stockportcounty.com. 28 November 2012. Retrieved 29 August 2015. ↑ McDougall, John (28 November 2012). "County as owners Cheshire Sport knock 65% off club's stadium rent bill". Mancunian Matters. Retrieved 12 August 2015. ↑ "Stockport County to rename stand in honour of Danny Bergara". BBC Sport. Retrieved 10 September 2013. ↑ Fitzgerald, Todd (20 June 2015). "Stockport County's Edgeley Park ground 'could be bought by the council to stop it being bulldozed'". Manchester Evening News. Retrieved 9 August 2015. ↑ Fitzgerald, Todd (24 June 2015). "Stockport County's Edgeley Park future to be decided at crunch council meeting". Manchester Evening News. Retrieved 9 August 2015. ↑ "Attendances – Archive : England 1998–1999". European Football Statistics. Archived from the original on 6 February 2012. Retrieved 15 April 2012. ↑ Spencer, Richard (22 May 2004). "Stockport County scores in China's business league". Telegraph. Retrieved 9 August 2015. ↑ "County's Tiger bid a roaring success". Stockport Express. 17 December 2003. Retrieved 15 April 2012. ↑ Spencer, Simon (19 March 2004). "China beckons for Stockport". UEFA. Retrieved 9 August 2015. 1 2 Stone, Simon (25 September 2015). "Stockport County: 'Man City were our rivals, now it's Curzon Ashton'". BBC SPort. Retrieved 25 September 2015. ↑ "Stockport 0–0 Carlisle". BBC Sport. Retrieved 9 August 2015. ↑ "History of English Football – Stockport County FC". European Football Statistics. Retrieved 15 April 2012. ↑ Scapens, Alex (6 September 2006). "Only sing when we're winning? County shout loudest, win, lose or draw". Stockport Express. ↑ "Fans page – a guide". cheadlender.com. Archived from the original on 22 March 2012. Retrieved 15 April 2012. ↑ "Top Tens". footballchants.org. Retrieved 15 April 2012. ↑ Scapens, Alex (16 February 2011). "County terrace tune is a winner". Stockport Express. Retrieved 15 April 2012. ↑ "Famous Football Fans". the-football-club.com. Archived from the original on 19 April 2012. Retrieved 15 April 2012. ↑ "The Beautiful Game: Robin Richards, Dutch Uncles – Stockport County". thisisfakediy.co.uk. 21 August 2012. Retrieved 8 September 2013. ↑ "HONOUR FOR DAZ". Stockportcounty.com. Archived from the original on 23 July 2011. Retrieved 9 August 2015. ↑ "Supporters Group Announcement". stockportcounty.com. 4 April 2013. Retrieved 30 August 2015. ↑ "Thank you. Again.". stockportcounty.com. 20 June 2014. Retrieved 30 August 2015. 1 2 "Players' Fund Partnership". stockportcounty.com. 12 July 2014. Retrieved 30 August 2015. ↑ Browne, Gavin (30 November 2013). "Stockport County fans continue to help the Lord". Manchester Evening News. Manchester. Retrieved 30 August 2015. ↑ "Turner deal agreed". stockportcounty.com. 6 August 2013. Retrieved 30 August 2015. ↑ "Alan thanks Help the Hatters". stockportcounty.com. 6 February 2014. Retrieved 30 August 2015. ↑ "Boardroom Update – 24/02/2014". stockportcounty.com. 24 February 2014. Retrieved 30 August 2015. ↑ Brownlow, Arthur (18 December 2014). "Club Statement – Regarding the Players Fund". stockportcounty.com. Retrieved 30 August 2015. ↑ Browne, Gavin (16 July 2014). "County's fans can do their share". Manchester Evening News. Manchester. Retrieved 30 August 2015. ↑ "Co-Op". Stockport County Supporters Co-Operative. Retrieved 30 August 2015. ↑ "Guardian Account". Stockport County Supporters Co-Operative. Retrieved 30 August 2015. ↑ "SCAN Scheme". stockportcounty.com. Retrieved 30 August 2015. ↑ "Fact Sheet On Stockport County Appearance Number Scheme" (PDF). The Football Supporters Federation. Retrieved 30 August 2015. ↑ Williams, Janet; Johnson, Mark (1995). Football Fans Guide. London: HarperCollinsPublishers. p. 236. ISBN 0-00-218707-8. ↑ Espley, Dave. "When Saturday Comes – Friend or foe?". www.wsc.co.uk. Retrieved 2016-10-23. 1 2 3 Espley, Dave (May 2003). "Friend or foe?". When Saturday Comes. Retrieved 30 August 2015. ↑ Road, Ian Whittel at Maine (1999-12-08). "Bad old days return to City varieties". The Guardian. ISSN 0261-3077. Retrieved 2016-10-23. ↑ Ogden, Mark (20 March 2002). "City upended by Hardiker". The Guardian. Retrieved 30 August 2015. ↑ "Manchester City football club: record v Stockport County". www.11v11.com. Retrieved 2016-10-23. ↑ "stockport county | Bluemoon MCFC | The leading Manchester City forum". forums.bluemoon-mcfc.co.uk. Retrieved 2016-10-23. ↑ Handler, Paul (2012-04-27). "Manchester derby map: MEN survey reveals where City and United fans really come from". men. Retrieved 2016-10-23. ↑ Williams, Janet; Johnson, Mark (1995). Football Fans Guide. London: HarperCollinsPublishers. p. 209. ISBN 0-00-218707-8. ↑ "Football Rivalries Report" (PDF). The Football Pools. February 2008. Archived from the original (PDF) on 15 October 2013. Retrieved 30 August 2015. ↑ Metcalf, Rupert (30 May 1994). "Football Play-Offs: County fall short as Burnley go up: Parkinson makes the difference". The Independent. Retrieved 30 August 2015. ↑ "Stockport County FC Player Profiles". Stockport County Official Web Site. 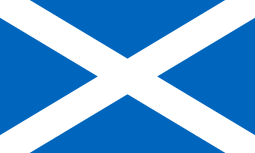 6 February 2015. Retrieved 6 February 2015. ↑ "Hall of Fame". stockportcounty.com. Retrieved 11 September 2013. 1 2 3 4 5 6 Brownlow, Arthur (12 August 2013). "Who's Who". stockportcounty.com. Retrieved 12 August 2013. ↑ "Club Statement". stockportcounty.com. 13 April 2015. Retrieved 13 April 2015. ↑ "Stockport County Manager History and Statistics". managerstats.co.uk. Retrieved 9 August 2015. ↑ "Honours". stockportcounty.com. Retrieved 8 September 2013. 1 2 Oliver, Pete (19 March 2008). "Stockport boss has a young vision". BBC Sport. Retrieved 8 September 2013. 1 2 3 Tomas, Jason (4 March 2007). "Leeds deeper in gloom as Nicholls says he wants away". The Observer. London. Retrieved 15 April 2012. ↑ Browne, Gavin (20 November 2013). "FA Trophy replay: Stockport County 2 Barrow 3". Manchester Evening News. Manchester. Retrieved 16 September 2014. ↑ "Two grounds have doubled up on staging League matches on the same day.". footballsite.co.uk. Retrieved 16 April 2012. ↑ "Stockport 3–0 Swindon". BBC Sport. 3 March 2007. Retrieved 30 August 2015. ↑ "Hennessey's heroics secure award". BBC Sport. 4 March 2007. Retrieved 15 April 2012. ↑ "Stockport County datafile". Google Documents. Retrieved 30 August 2015. Wikimedia Commons has media related to Stockport County F.C..